The dulcet tones of Radio 4 have just started on the headlines. You reach across the bed and slap the huge snooze button on the radio. Peace at last. 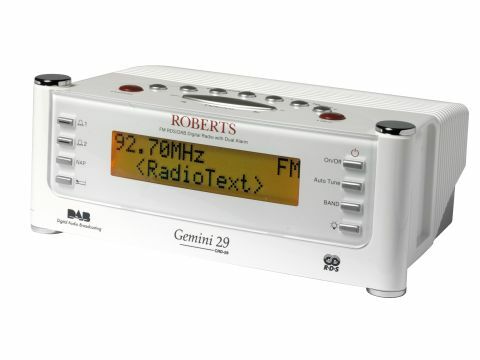 Not so with Roberts' Gemini CRD29, a rude awakening to the world of DAB radios as the CRD29 lacks the simple design that a lot of competitors base their models around. The mono speaker we can live with. On such a small radio that's quite obviously aimed at the bedside table, it makes little difference to sound quality especially if voice radio is your thing. Sound quality is average for a radio of this size and price and if listening to crystal clear music is your goal, you're going to look elsewhere. Slung between two stubby posts, the radio's operational controls are presented both on the front and top. That informs our first gripe, because the buttons are simply tiny and labelled poorly. Scanning between stations is simple to do, but does involve using more than one button to select a station - and they are hidden away on the top of the unit. That's needlessly complicated considering its intentions in the bedroom. And it gets worse. On the front are fiddly controls for two alarms, one for napping, a tiny sleep button, a DAB/FM toggle and an autotune button. The top of the CRD29 houses the controls for flicking between stations as well as ten preset station buttons, a snooze button and two huge red buttons. Their purpose is to change the info shown on the LCD display from scrolling news headlines to details about the signal strength or the genre of the station. Holding either red button down for a few seconds accesses advanced menus, manual tuning or inspecting the software version being used. At least the volume controls on top are sensitive and their levels shown on the excellent LCD screen. Bright orange and easy to read, the two-line display is big enough for the bleary eyed to read. The telescopic aerial on the back is far too bulky and didn't prove of much use during our test because the unit tuned in perfectly. The CRD29's connectivity options are actually a high point, because as well as a headphone jack there's also an auxiliary input. The latter allows hook-up of an iPod or any other audio device you care to name. Better still, the CRD29 automatically selects whatever you plug in without any need to tinker with the radio's controls. Considering the plummeting cost of DAB radios, we're surprised Robert thinks it can fish for £100 with the CRD29. Don't be shocked if it's going for £50 sometime soon.